Nanoxia did not rest when it brought out its first Deep Silence case. Given that it was named Deep Silence 1, we should have expected a Deep Silence 2. And sure enough, the Deep Silence 2 has arrived. Is it a case that delves deeper into deep silence? Let us explore this sleek creation and see. When you look at this Nanoxia DS-2 you see shiny black sides, with the sheer planes interrupted only by the crevasse marking the front door covering the 5.25-inch slots, and the vent slots along the edges of the front plate. This is a Dark Black case. The Deep Silence 2 also comes in Silver, Anthracite and White. All share the clean Nanoxia look. 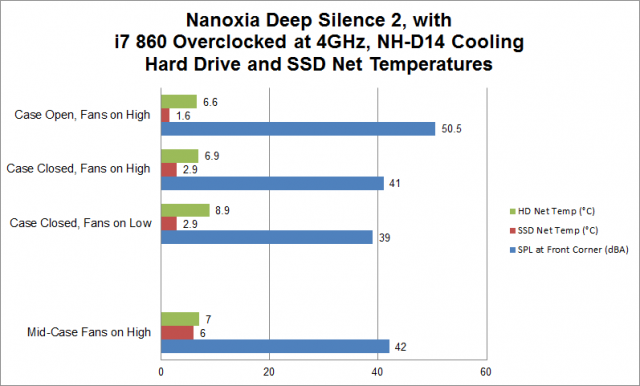 Let us have Nanoxia speak to you about their case and the features it offers. 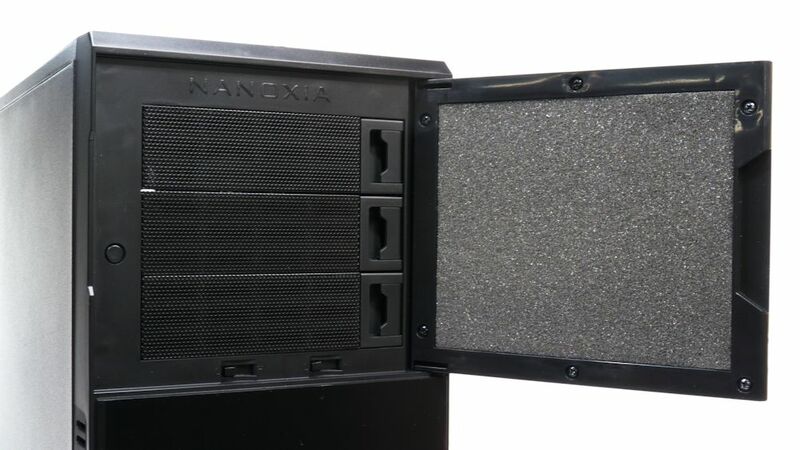 Almost noiseless – The guiding principle in the development of the Nanoxia case series has always been the requirement to create cases as quiet as possible at the lowest system temperatures. Just like with the Deep Silence 1, the side panels and top cover of the Deep Silence 2 are fitted with specially designed, noise reducing insulation materials to minimize and absorb any noises. The solid front door uses sound absorbing materials contribute significantly to the most effective noise reduction. 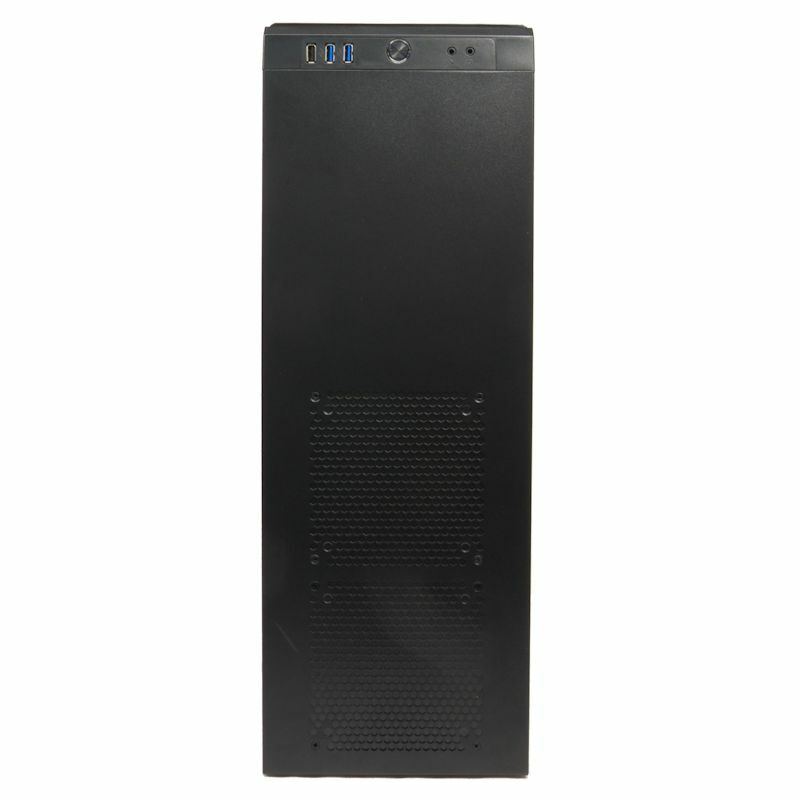 Intelligent ventilation system – As many as three high-quality Nanoxia Deep Silence fans are preinstalled in the case. Behind the front cover, two 120 mm fans rotate at a maximum of 1,300 RPM. At 14.2 dB(a), the Nanoxia Deep Silence 120 mm fans generate an air flow of about 60.1 CFM and a static air pressure of 1.27 mm H²O. Versatile Features – The installation of the front fans behind the front cover is very easy: The dust filter offers mounting holes for either 2 x 120 mm fans or a single 140 mm fan. 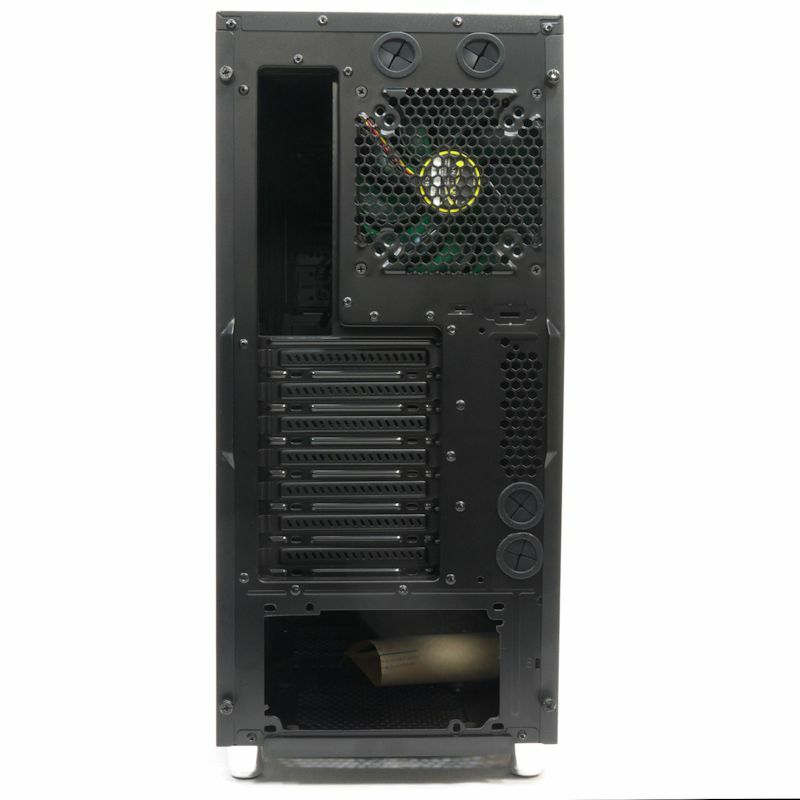 The preinstalled 120 mm Deep Silence fans are attached to the dust filter, which in turn is bolted to the front with 4 screws. The optical drives can be mounted without requiring tools. 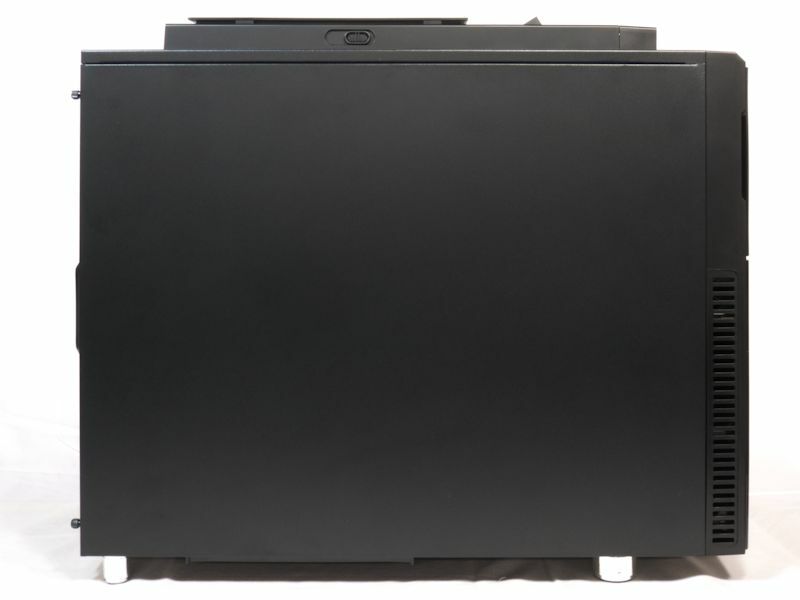 A total of three external 5.25″drive bays are available. A 5.25 inch to 3.5 inch adapter is included. 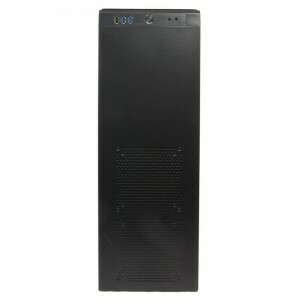 You can also accommodate up to seven 2.5 inch or 3.5 inch hard disk drives in the Deep Silence 2. 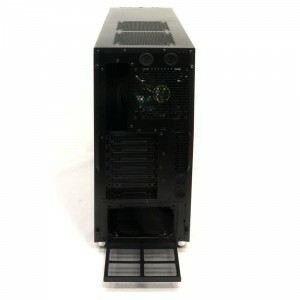 Water Cooling ready – The mounting bracket allows the internal assembly of a water cooling system (120 or 240 mm radiator) and up to four fans between HDD cage and motherboard – without colliding with the motherboard or power supply. 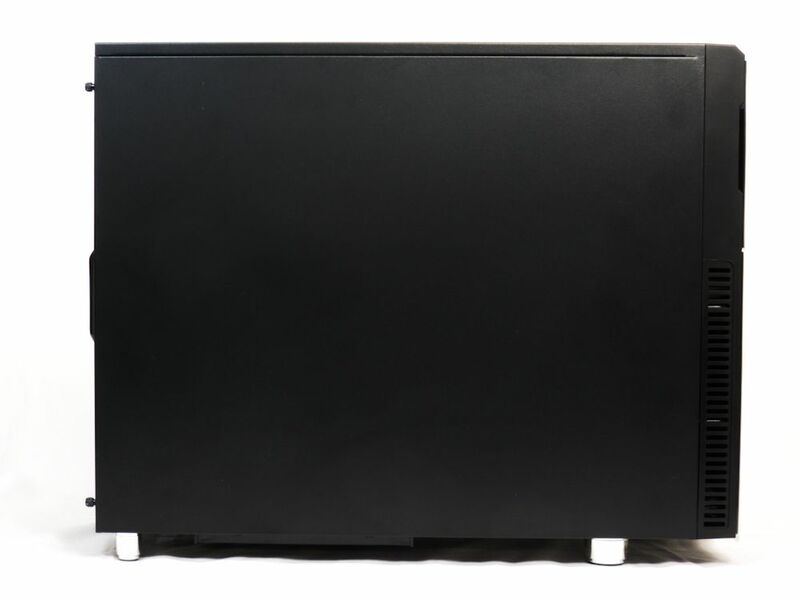 Radiators may thus be cooled without case modifications in a push-pull set-up.In conjunction with the two pre-installed 120 mm Deep Silence fans behind the front up to six fans provide for a superior cooling performance of the water cooling system. 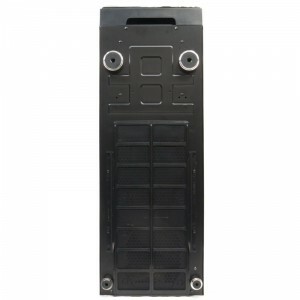 Four additional rubber hose guides for external water cooling solutions can be found on the rear side. 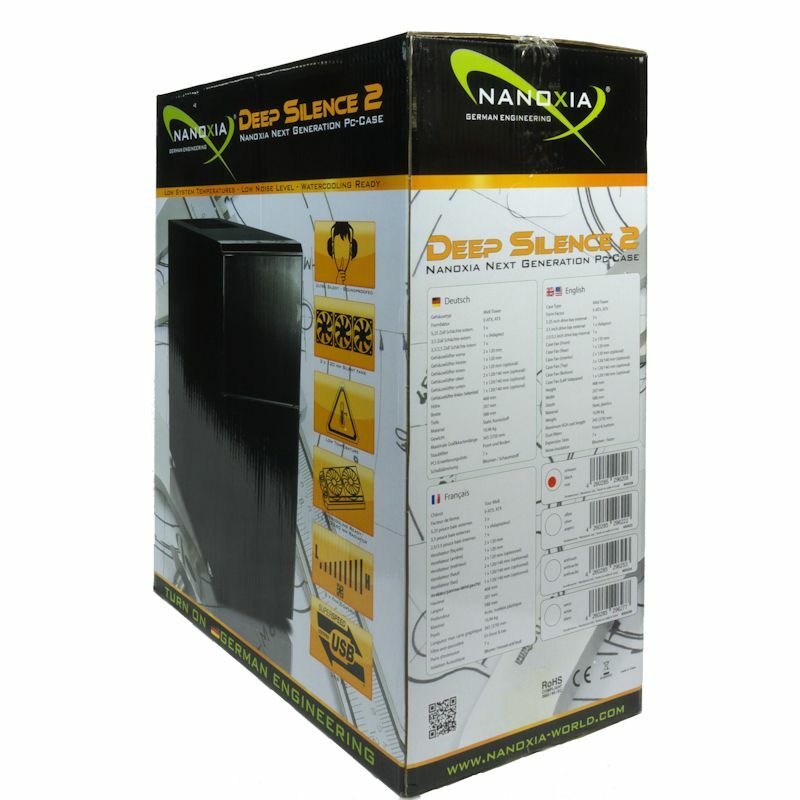 The Nanoxia DS-2 product page continues by listing other features we shall cover further along in the review. 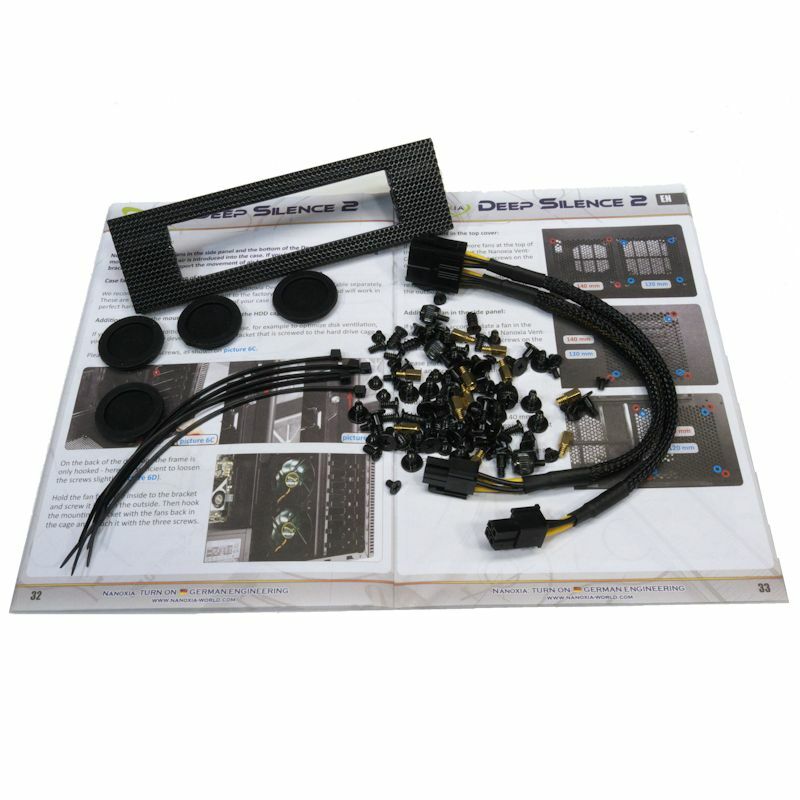 The product page is well worth visiting because of the exploded view diagram of the Deep Silence 2. Clicking the diagram below will open a large 3070×1980 pixel picture. You can r-e-e-a-a-l-l-y see what the DS-2 looks like and how it fits together. Here are the specifications, also provided by Nanoxia. This case came to me in a well-guarded outer carton. Inside was the Deep Silence 2 retail box, covered with lovely color pictures, diagrams, and a feature list in three languages. 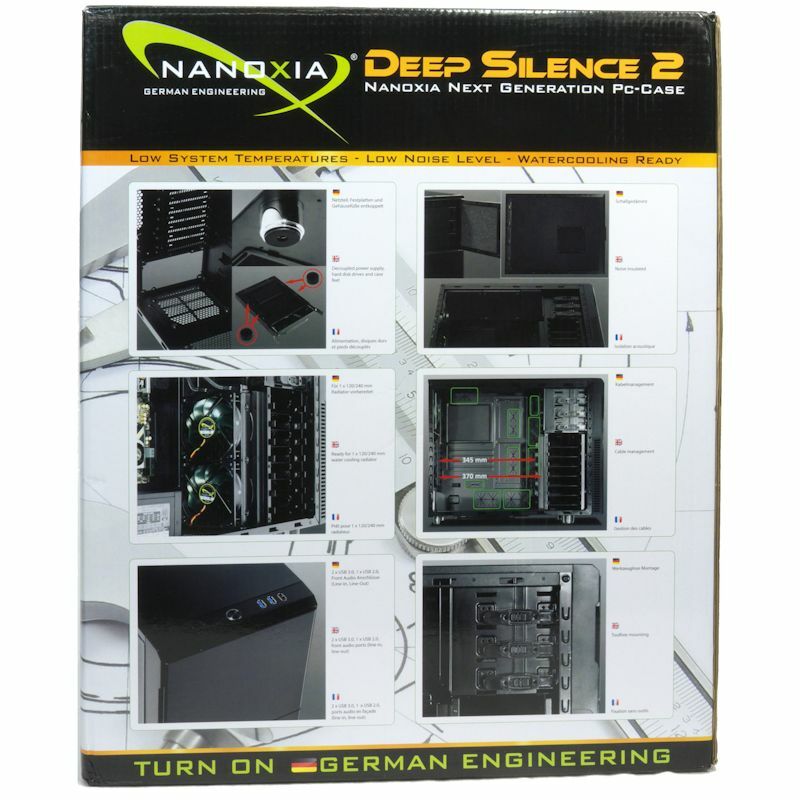 The back side of the box shows many of the salient features of the Deep Silence 2. These pictures delineate what you can do with the Deep Silence 2, and how to do it. The opened box shows something I wish more manufacturers would do. The top and bottom caps are made of compressible foam. 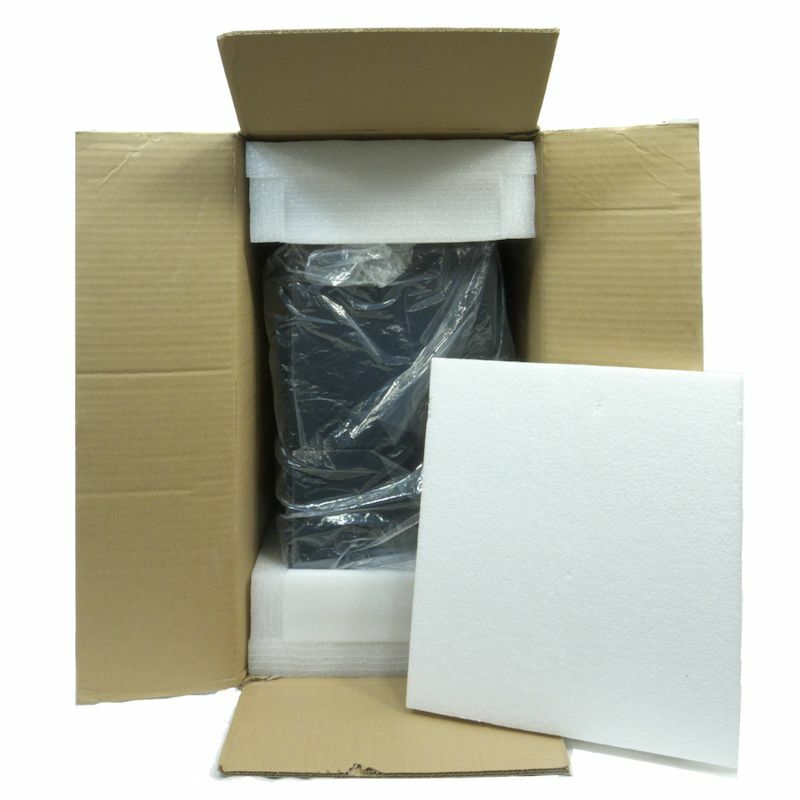 Not only will this resilient foam nicely attenuate any collision forces – such as dropping a corner on concrete – but it will not shatter on impact. Such a small detail, but important. 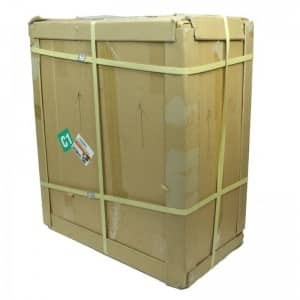 Although nothing will stop something that stabs through a box, the panel you see protects the face of the case from any blunt force incursion. Very nice if you have neglectful delivery people. Inside the plastic bag, the face of the case is further protected from scratches by a plastic film. Peel it off and the clean look emerges. At this point I have to tell you about the manual for the Nanoxia Deep Silence 2. It is wonderful. Inside the manual’s cover is a fold-out diagram of the case – the same diagram reproduced above. The manual has 60 numbered pages, in German, English and French. Let us open the front door of the Deep Silence 2. We can see the reset button on the left and the twin fan controllers on the bottom. The three 5.25-inch mesh covers are identical to those of the Deep Silence 1. There are easy-to-use latches on the right ends of the slot covers. The inside of the front door is lined with sound-deadening foam. The top view shows us the IO cluster at the top front of the case. 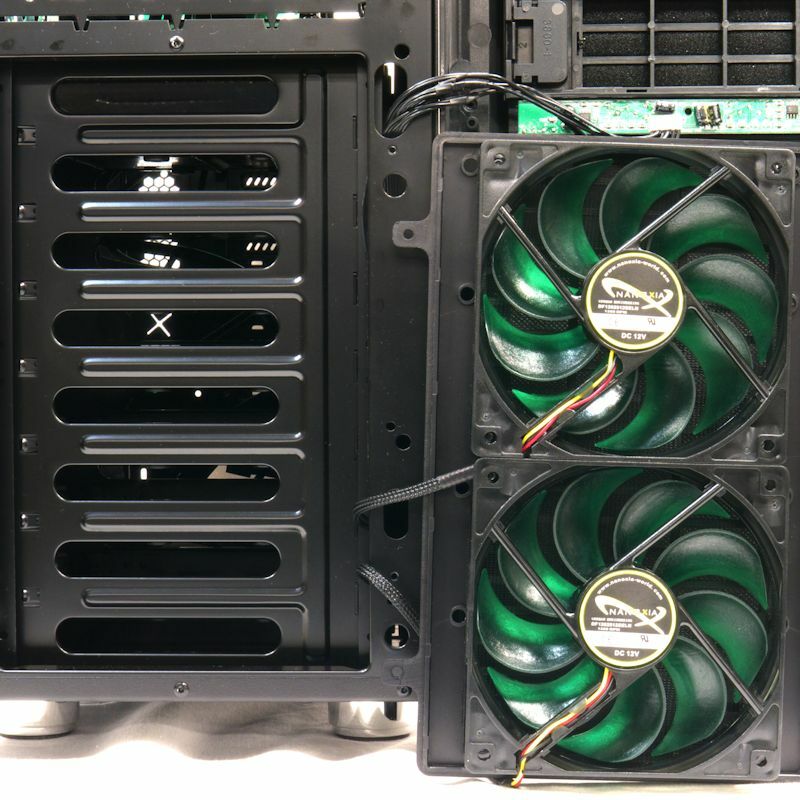 The two grill sections will fit 120mm and 140mm fans, but the fan positions do not appear to be snuggled up to each other the way we would expect for radiators. As the case arrives, the top fan positions are blocked with foam-backed squares. Having grills there is inescapable even though they restrict airflow. Continuing on to the back, we see four grommets for radiator hoses, just in case you mount a rad outside the case. 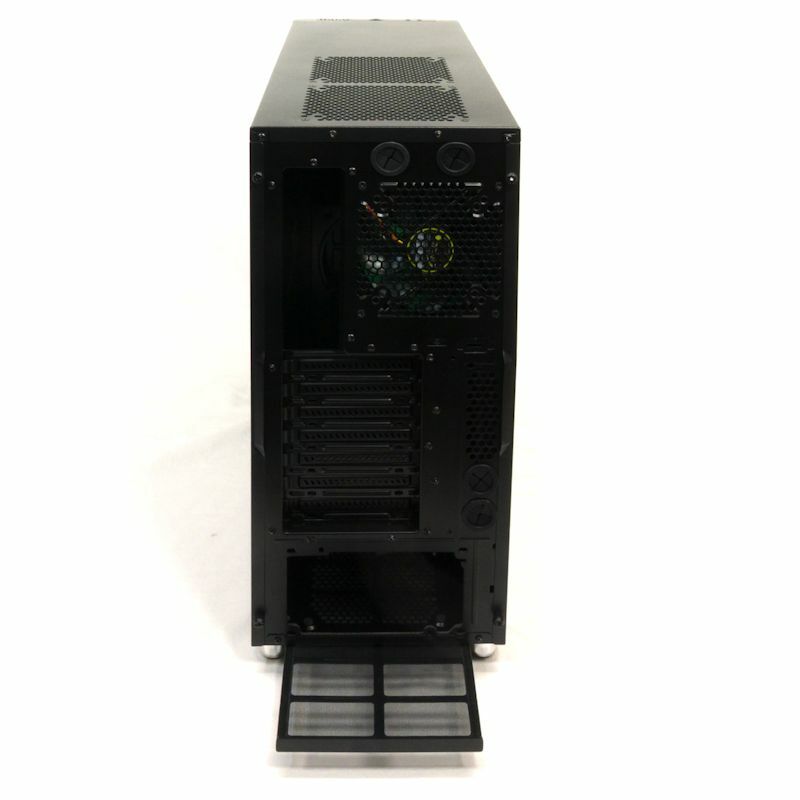 There is the stock 120mm fan, seven expansion slots and a place for a bottom mounted PSU. Standing back, we get a view of the blocked top vents, the back of the case and a partly-extruded bottom filter. 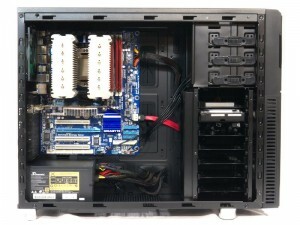 Which leads us to the bottom view, where we see that bottom filter covering the space for the PSU and bottom intake fan. With the filter slid out, the first potential drawback of this case becomes evident. 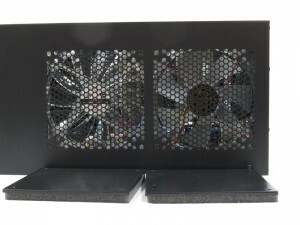 If you are serious about airflow, do you really want a grill reducing airflow to your fans? It is nice that the bottom intake fan has screw holes for 120mm or a 140mm fans, but that grill restricts airflow. I will only call it a potential drawback because some people grab their case there, so you wouldn’t want fingers ripping the fan filter and damaging the fan. So, we’ll give it a pass. 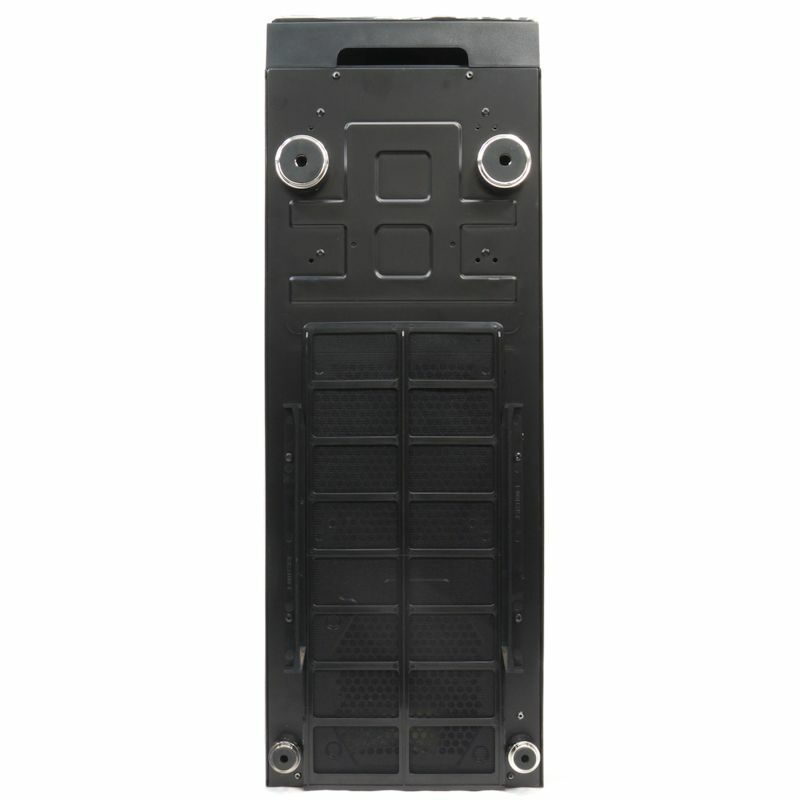 Surrounding the grill for the PSU are four dimples. Those provide support for the PSU inside the case. Looking at the side panels, we see the air intake vents built into faceplate for the front fans. Other than that, the sides are pristine, maintaining the Nanoxia clean look. The website and the manual clearly contemplate an optional fan for the left side panel, but that option appears to have been let go. Instead, we have sleek sides. Now is the time to compare the DS-1 and the DS-2. Seen from the front, you can’t tell them apart without a scorecard. 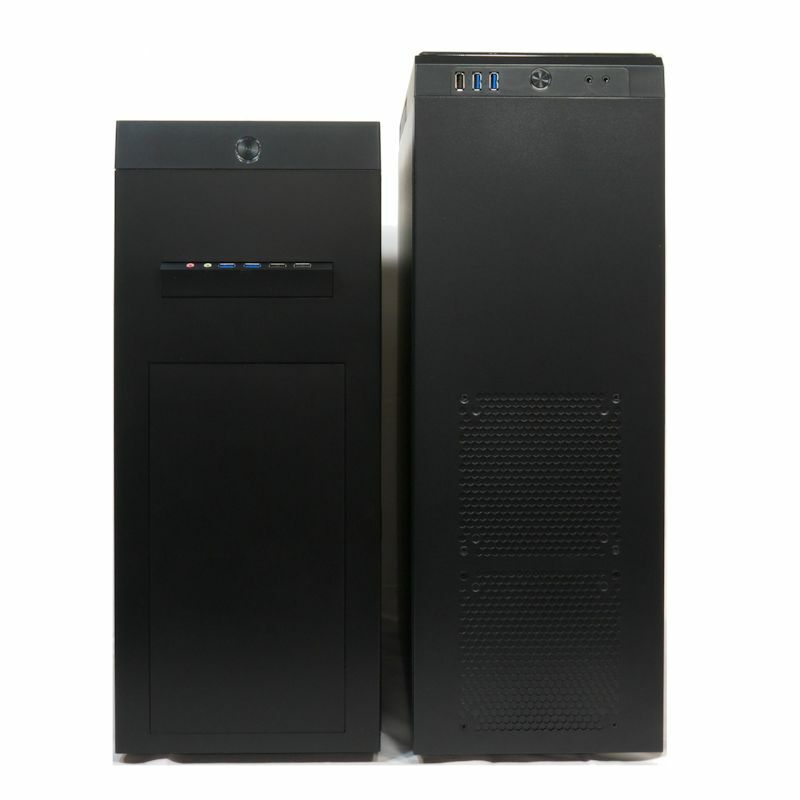 Well, here’s the scorecard: the case on the left, the taller one, is the Deep Silence 1. The case on the right is the Deep Silence 2. 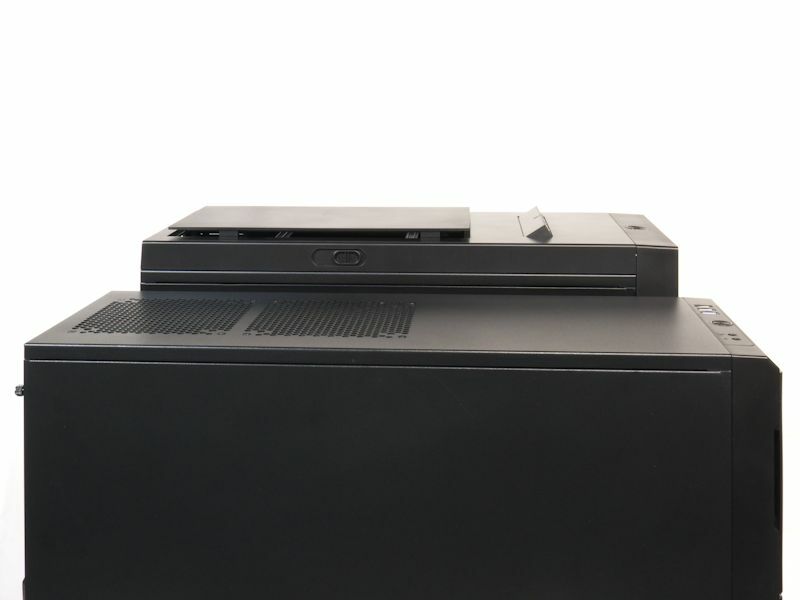 The top view shows us the differing features (DS-1 on the left, DS-2 on the right). The DS-2 is longer. Now we will change their positions and show the DS-2 from the left. You can see their relative heights and lengths. The DS-1 is taller. Let’s open up the Deep Silence 2 and examine its innards. First we look at the right panel. 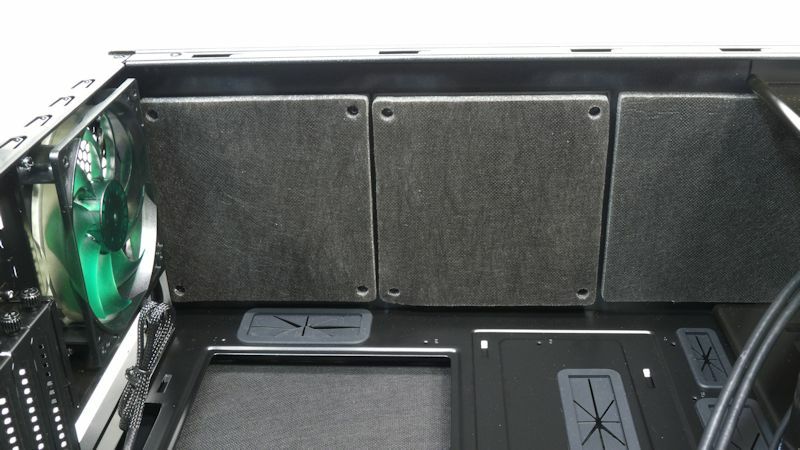 It has a layer of vibration-dampening material, to keep the case from sounding like a drum. The left panel has that, and a sound-absorbing layer as well. This acoustic deadening adds considerable weight to this case. The panel clasps are a little old-fashioned. They add some difficulty to working with this case, both in removing the panels and putting them back. Nanoxia could step up their game here. 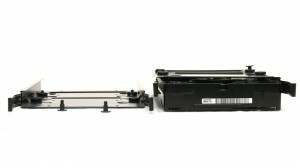 Under the right panel we have a clear view of three tool-free 5.25″ slot latches, which are found on both sides of the drive bays. 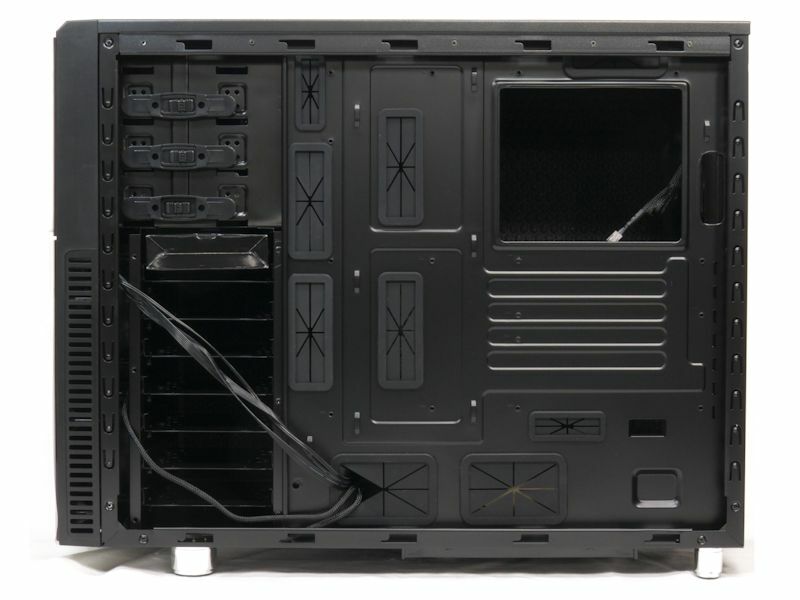 We can see nine cable grommets (one is above the CPU window) and eight tie-down points. The upper cables include normal IO and motherboard wiring, along with wires from the fan controller. The two lower cables come from the front fans. Next we look under the left panel to see where the motherboard will go. Clockwise from the upper right, we have three quick-release tool-free latches for 5.25″ equipment. Under that is the box of accessories stuffed into the topmost of seven 3.5″ hard drive sleds. The case wiring is neatly bundled. The dimples supporting the PSU have rubber disks on their tips to help absorb vibrations. 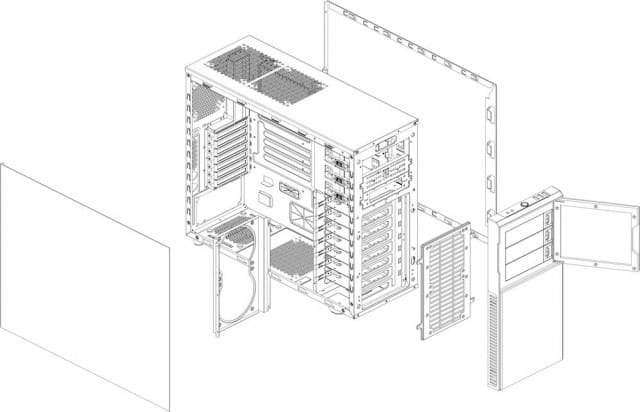 We can see the seven expansion slot covers are fastened with thumbscrews. 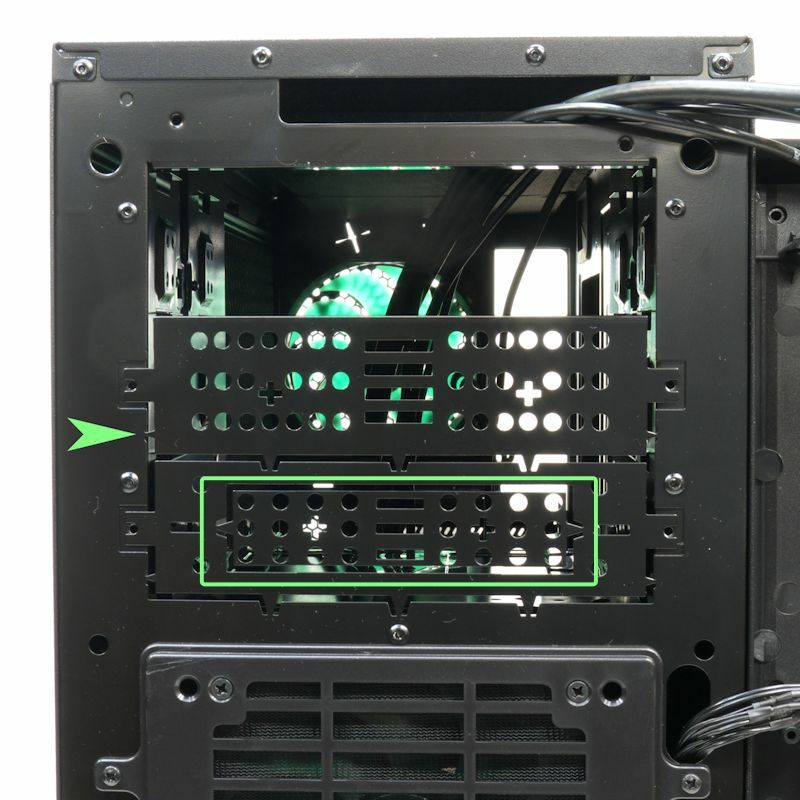 The 120mm exhaust fan’s cable is neatly bundled, and the CPU cooler access window is as large as it can be and not interfere with the motherboard standoffs. The case does not come with any pre-positioned motherboard standoffs. For ease of motherboard installation, it would be nice to find a peg in the middle position. Here is a shot of the underside of the plates that block the top fan positions. You can see they are backed by foam pads. The rightmost pad is stuck to the case itself, absorbing sound that might try to bounce off the inside of the case top. Under the front plate is the filter for the two included Nanoxia DF1202512SELN 120mm fans, or a single 140mm fan. The plastic frame looks unduly restrictive, but the filter is designed to stand up to vacuuming. The front plate comes off easily enough, so you can clean the filter and put it back together in less than a minute. The 5.25″ bay shows us that Nanoxia expects you to put your device in the top slot. The arrow points at one of the metal bridges that link the middle slot front plate to the case frame. If you remove it you can screw the plate back on later. Interestingly, that remove-and-replace option is not available for the top slot. The third slot has a 3.5″ plate, outlined by the green rectangle. If you pop that off, there is a 3.5″ adapter on the floor of the 5.25″ bay for a card reader. 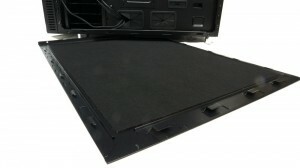 When we get to the accessories you will see they have supplied you with a slot cover that has a 3.5″ opening in it. If you remove the front filter the fans come off with it. The filter has positions for a single 140mm fan at the top or in the middle. Behind the fans lurks the HD cage. This is probably sturdier than it needs to be, but it does allow air to flow across the top of the hard drives to keep them cool. In the second picture, that frame with the large peanut-shaped cutout is the double 120mm fan mounting bracket. It will hold two 120 x 25 mm fans, either as pull fans for your hard drives, or as push fans for a radiator. One puzzling bit is the screw holes. On the other side of the mounting bracket there are open slots, which allow the bracket to be slid up and off without removing any screws. When you have put your fans on the mount you press it against the HD cage from the left and slide it down. Then you tighten those back screws. The slots work fine, which leaves us to wonder why they didn’t use them on both sides. 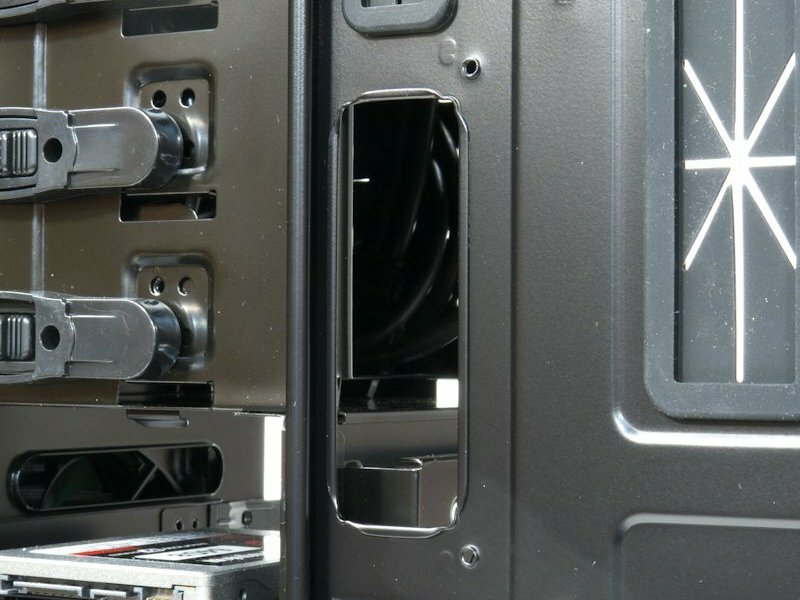 As it is now, you must remove the screws on the left side of the case to get the mounting bracket off, while on the right side you can leave the screws in place. 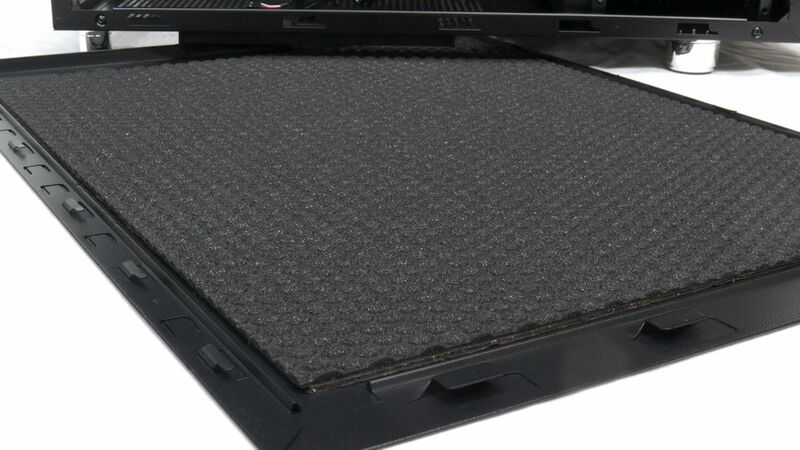 The HD trays have mostly solid bottoms with vibration-dampeners that keep the hard drives lifted up from the HD trays, preventing the trays from cooling the hard drives’ bottoms. 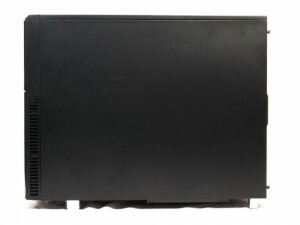 With no air coming up through the bottoms of the HD trays, the airflow cools only the tops of the hard drives. A close look at the HD trays highlights those vibration-dampening pads. Shanked screws thrust up through those pads to fasten onto 3.5″ hard drives. 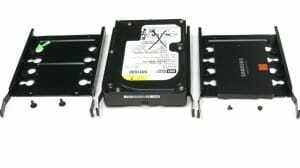 2.5″ SSDs are fastened in the middle with small machine screws. But what if you have a left-over 2.5″ hard drive you removed from a laptop that you want to use in this case? 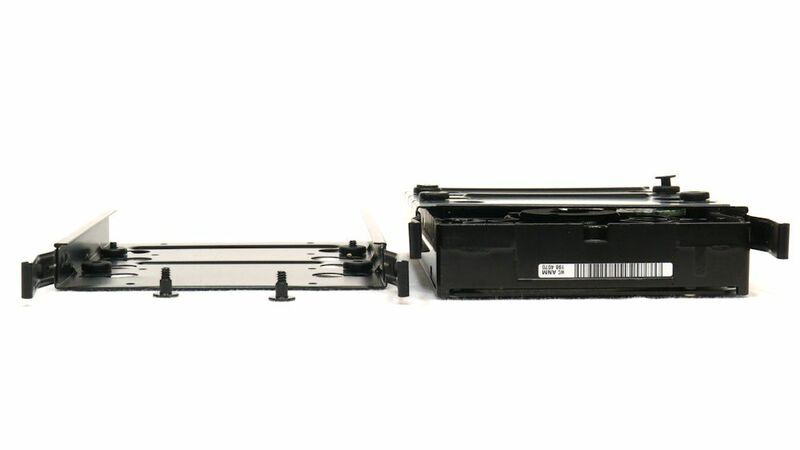 They have the same screw holes for bottom mounting as SSDs, but there is no way to mount 2.5″ spinning-disk hard drives with vibration-dampening pads. The second shot gives you a better appreciation of how a drive fits into the HD trays. 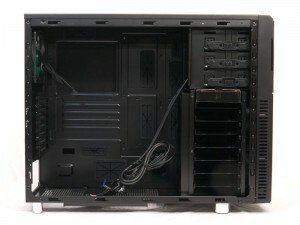 Before we start building in this case, we should examine the case wiring. 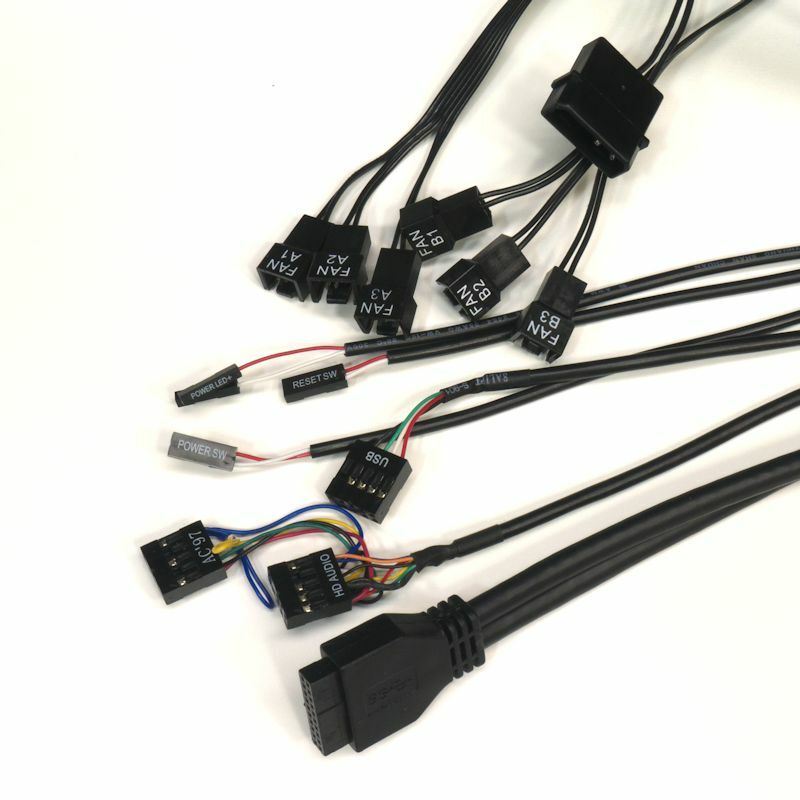 At the top of the first picture you can see that the fan controllers – both of them – are supplied with a Molex plug. The two controllers control three fans apiece, which means this case can fine tune your “fannage”. We have one USB 2.0 plug. You can have HD Audio or AC ’97, but who uses the latter these days? Finally, a double USB 3.0 plug. The lengths of the wires are adequate for the case. The second photo shows the assorted screws and accessories sitting on top of the detailed and specific manual. 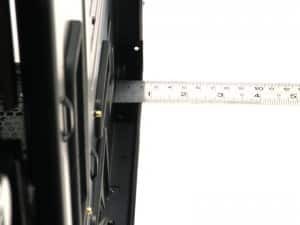 We can see the 5.25″ to 3.5″ slot cover adapter, four rubber plugs to replace the four grommets at the rear of the case, and all the screws and standoffs you’ll need to put a system in the DS-2. You will come to appreciate the EPS 4+4-Pin extension. Now we’re ready to build a system in the Deep Silence 2. See that EPS extension in the picture above? Plug it into your motherboard now, so you don’t forget to do it. 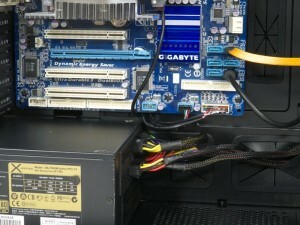 In fact, you can plug in your other cables before you actually screw down your motherboard. Especially when the geometry of the motherboard puts your audio header in a hard-to-reach spot. Plugging everything in before you lock anything down makes your job easier. Only now do you move the motherboard to its spot. So, screw in your board. Too bad the plug on the free end of the EPS extension has such a hard time getting through the motherboard tray. 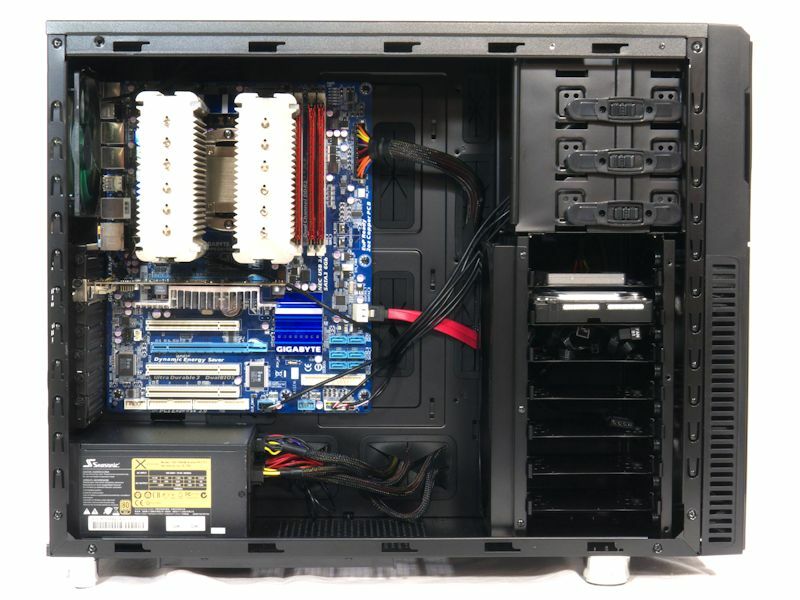 The top of the case hangs down just enough to make putting the plug through a hard job, especially when you are balancing a motherboard with a large heatsink on it. With everything installed, it looks great. But the wires look a tad messy. So we’ll use the pass-through under the motherboard to neaten it up and clean up the airflow. Here is where having long enough wiring comes into its own. 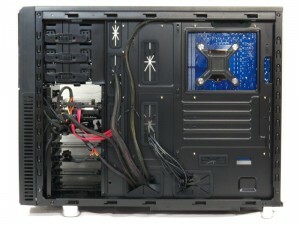 Not all cases allow you to make such a neat arrangement with your motherboard wires. 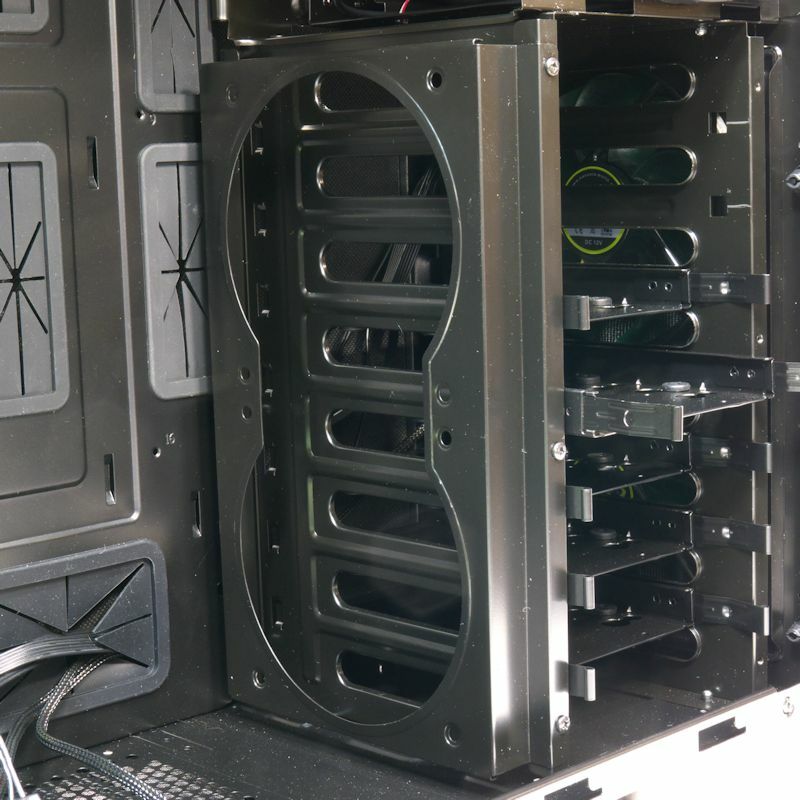 Turn your case around, and you can see the CPU cooler access window is indeed generous. Now, you don’t really need those grommets. Pull one off and you will see rolled edges in the pass-throughs to keep your cables from chafing. But there is less than 2 cm (about 5/8 Inch) behind the motherboard tray for cables. 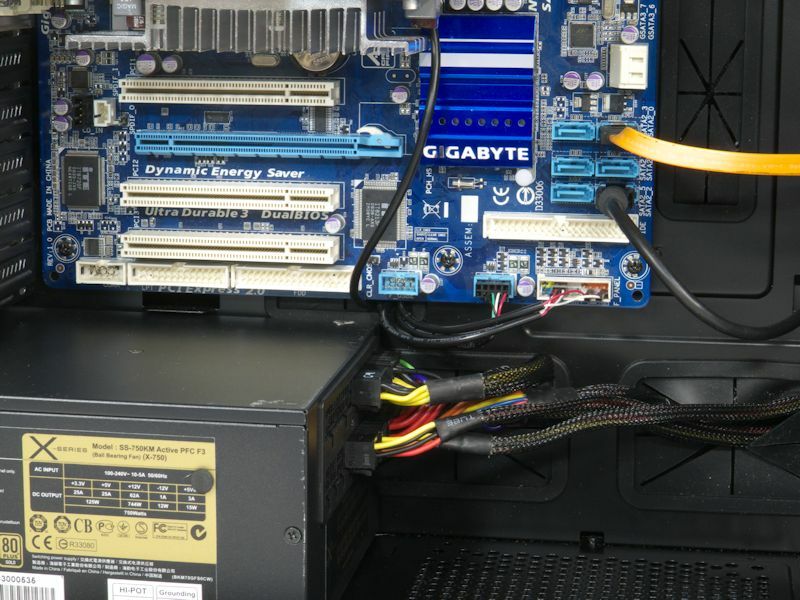 That leads to this: SATA data and power cables sticking out from the case. 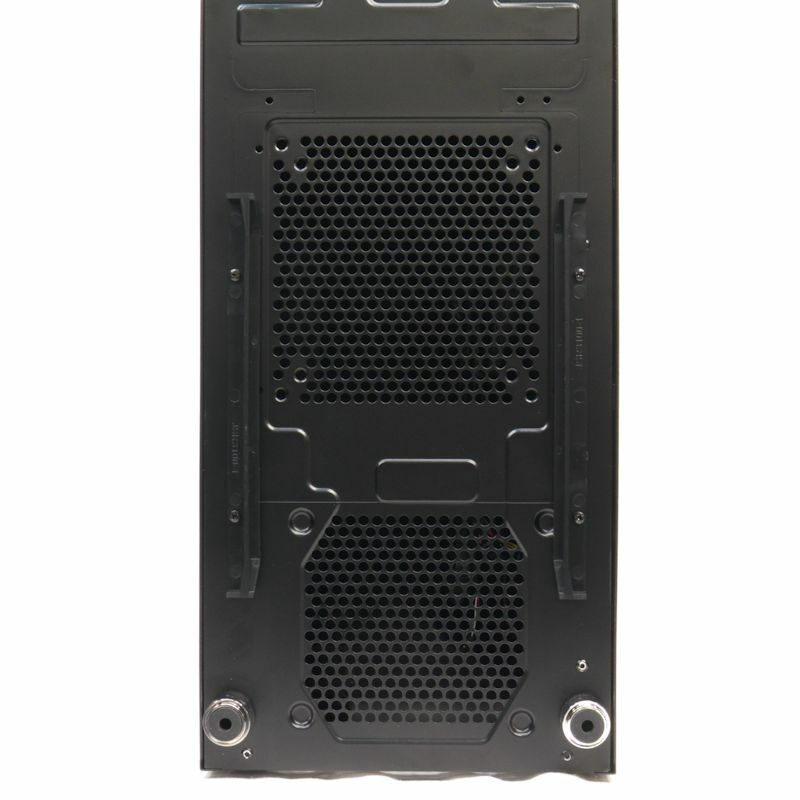 Putting the right side panel on the case – never easy – became an impossible job with the case vertical. I have to lay it flat to put down the panel (remember that the panel has anti-vibration padding on it). All in all, I’d say this case would have benefited from a full inch behind the tray. What else could you do with this case? You could put fans in the top. The picture below shows the top plates removed and replaced with fans. You can see the thickness of the foam. Nanoxia seriously wanted to muffle this case. You can also see a couple of 140mm fans mounted. 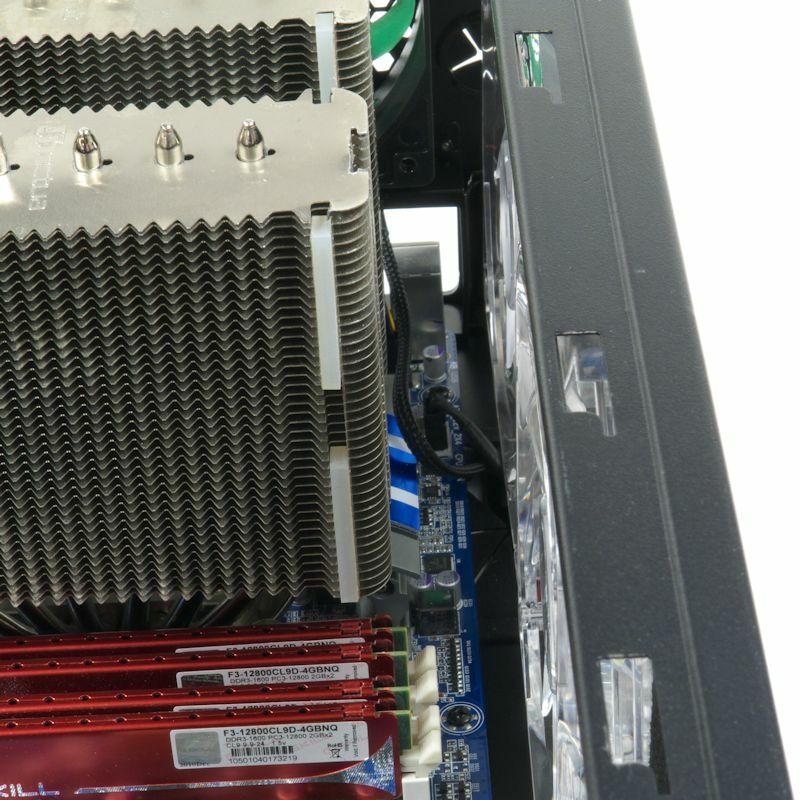 Note that the screw holes are set up for separate fans, not 240/280mm rads. If you wanted to mount your rad here, you would have to make you own screw holes. But look below. 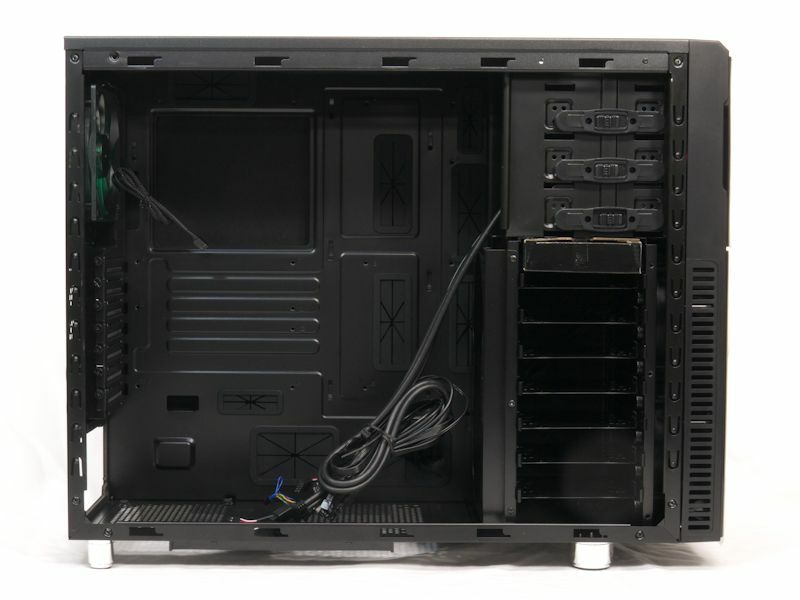 In the top of the case there is room to install fans with the motherboard present, but there is not quite enough room for a rad. Not quite. When you plug in your system and let it run, what do you get? You get a quiet system. With the Sound Pressure Level meter positioned 10 cm from the left corner of the case, it gives a reading of 40 dBA with the front fans at the top of their range (call it High), and 37 dBA with the front fans at the bottom of their range (call it Low). 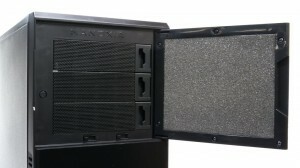 With a standard adjustment to a 1-meter distance, then, the noise this case makes is 20 dB at High, 17 dB at Low. This is a pretty quiet case. The only fly in the ointment is that the fans click. 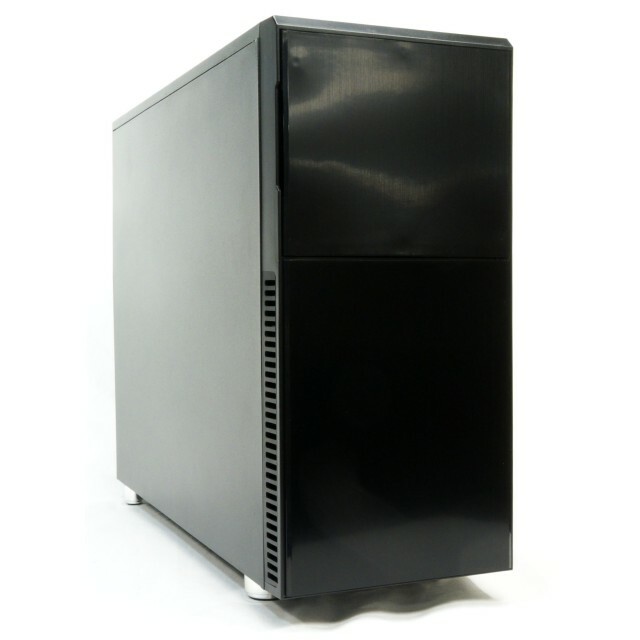 The clicking is quiet, but because the case is so quiet you can hear it. 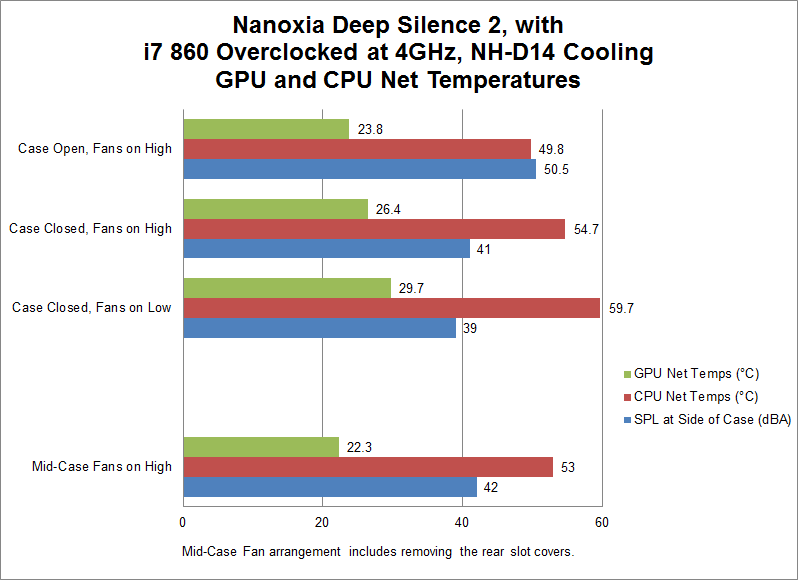 We are going to compare the cooling prowess of the Deep Silence 2 to four other cases. 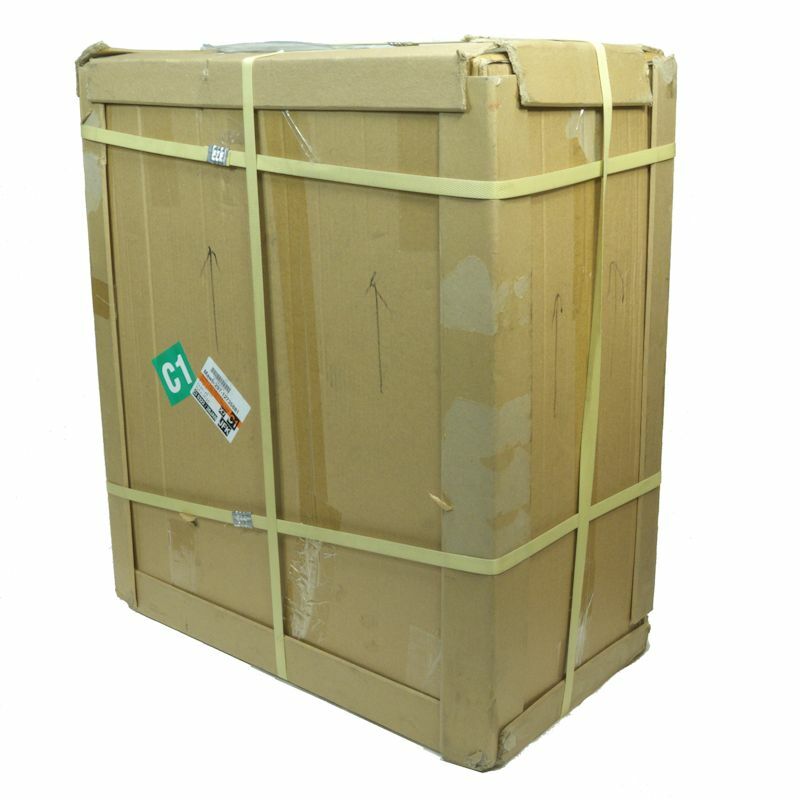 We are also going to look at the noise these cases make in cooling their contents. 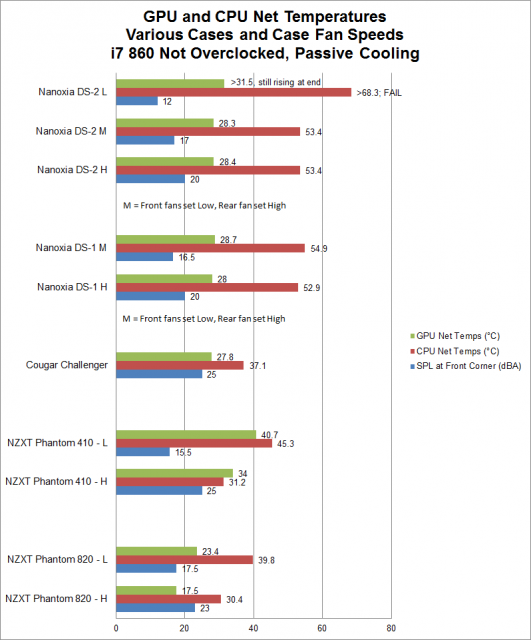 For the test method, we shall look at passively cooling a CPU and a GPU. We will also look at the effects of the cases’ airflow on an SSD and a spinning-disk hard drive. 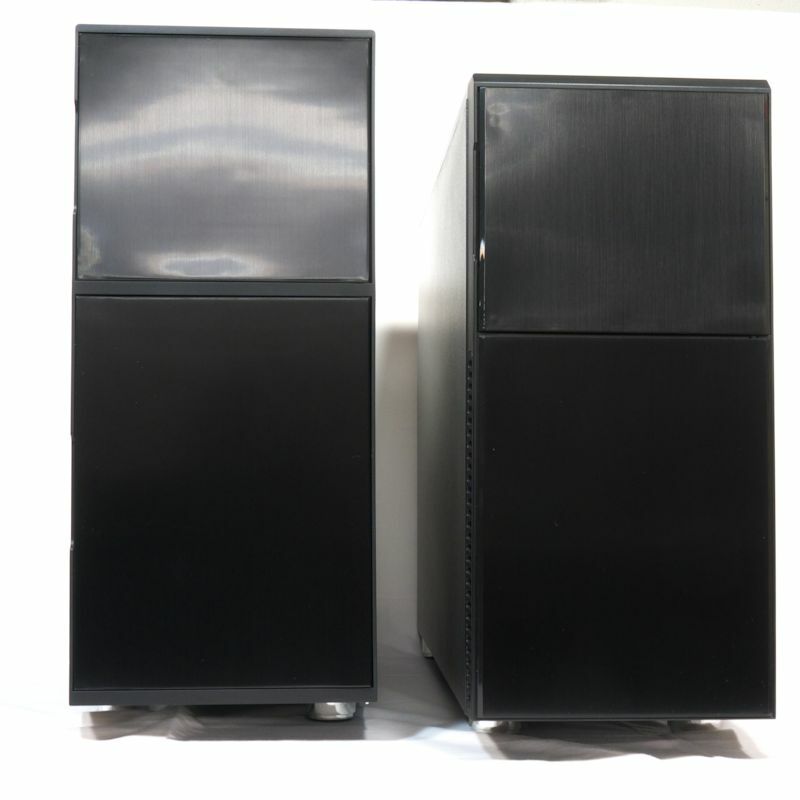 Aside from the case fans, the HD platter stack will be the only moving object in these cases. Why do it this way? 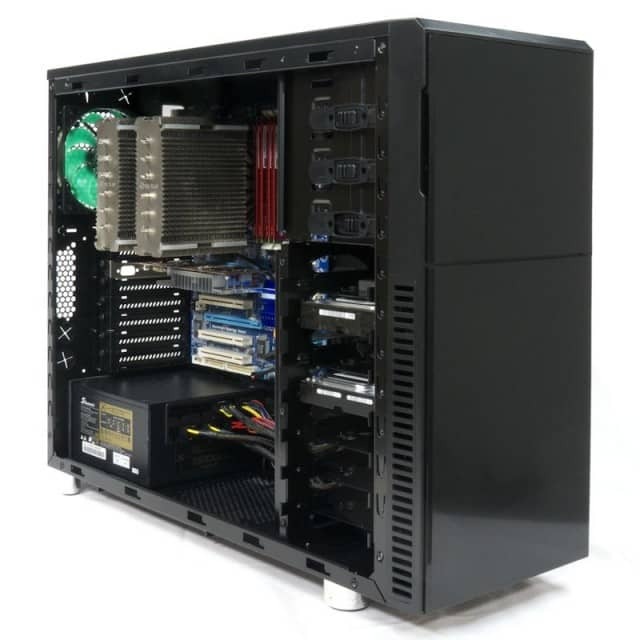 Everybody else uses normal systems, with heatsink fans or coolant pumps. Why a passive system? Because the only real way to test the noise a case makes is to measure the noise the case makes. That means nothing else can make noise. 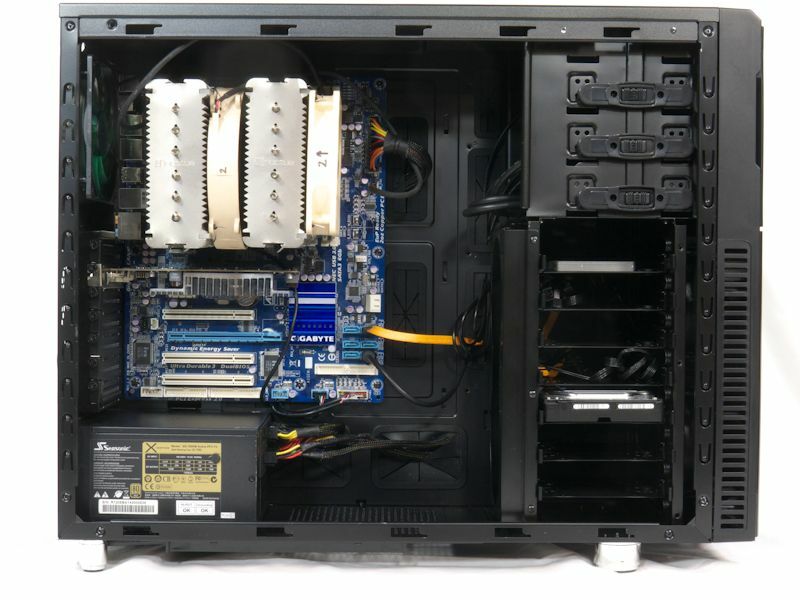 And that’s what we have: five systems where only the case fans make noise. The setup you see below is the system I moved from case to case to see how hot the cases would let their contents get, and how much noise they made in the process. What this system did was to let the airflow through the case carry off the heat from the NH-D14’s fins. 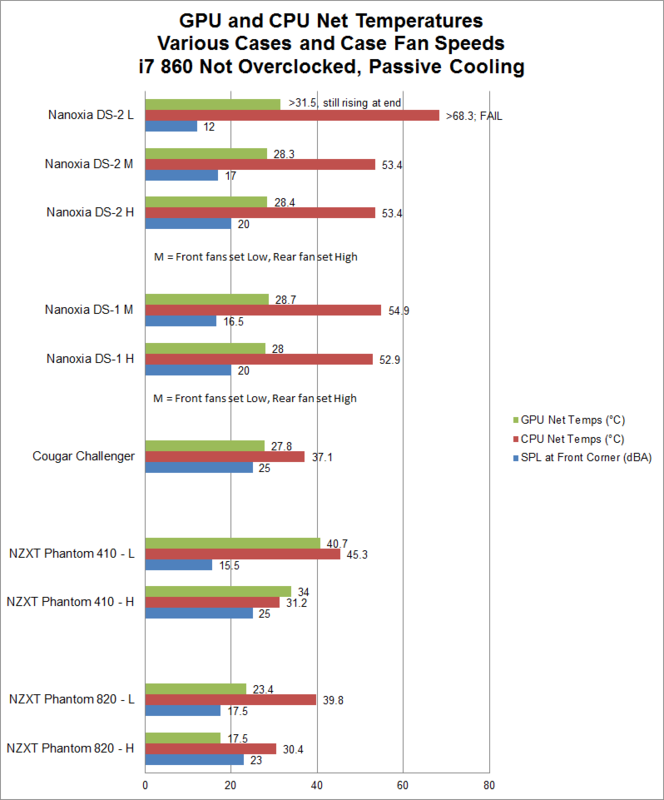 Each test was run 60 minutes, with the later 40 minutes averaged for net temperatures — CPU/GPU/SSD/HD temps minus ambient temperature (measured outside the case). The results from the first 20 minutes were discarded while the system was reaching its thermal equilibrium. 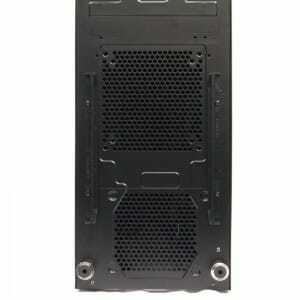 Motherboard GA-P55A-UD3P; supplied 1.1125 Volts to the CPU. The SPL (Sound Pressure Level) readings were taken at 10 cm diagonally from the front left corner. A 20 dB adjustment was made to make the SPL reading comparable to that at 1 meter. 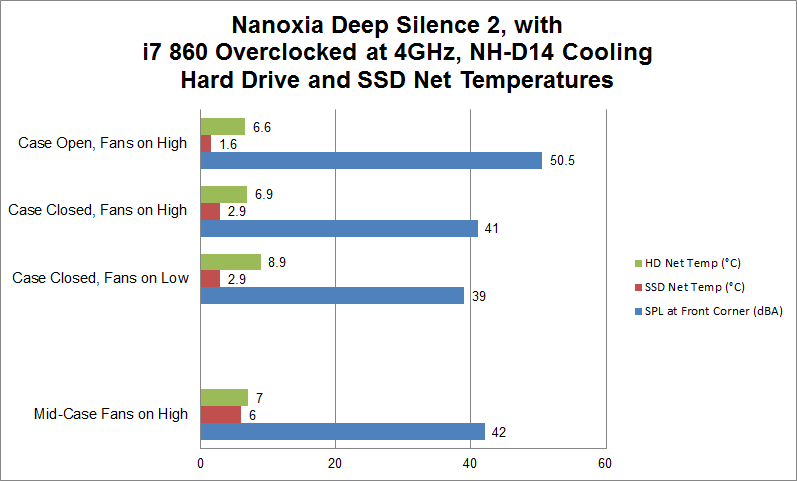 The chart below is the Nanoxia Deep Silence 2. Because the fan speeds could be varied, they were set to the minimum setting on the slider (Low) and the Maximum setting (High). Because the Low setting on the DS-2 is really low, it means the fans blow little air. So the CPU temperature hit 87 °C at 14 minutes 28 seconds into the run, and OCCT shut itself down. For this reason, a compromise (Medium) was arranged for the DS-2 and the DS-1 (it had similarly slow fans on Low). The front fans were set at Low while the back exhaust fan was plugged directly into the PSU (equivalent to High). BTW – If you put your ear up next to the front vent you could hear a faint hum with all three fans set to Low. At a few inches there was essentially no noise. Very quiet indeed, but not very cool. As you can see from the chart, both Deep Silence cases were very quiet. They paid for this silence with relatively warm net CPU temps. That there was not much difference between the M and H readings of CPU temps reflected the fact that the airflow was mainly coming from the exhaust fan, which was unchanged between M and H in both cases. We have established that the Deep Silence 2 is a quiet case. 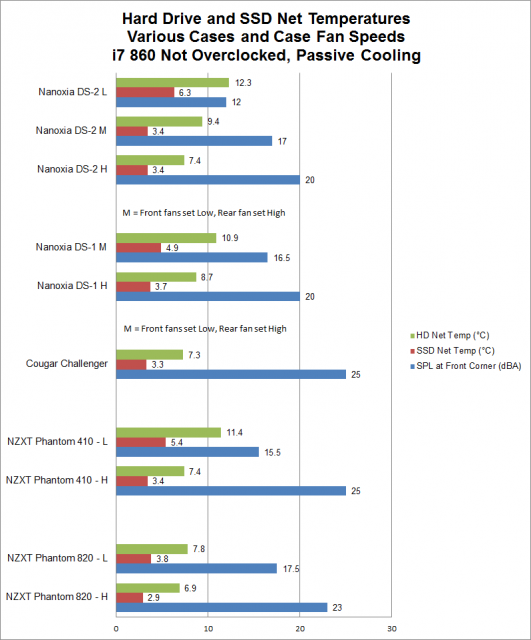 Note that the NZXT Phantom 820 is the only one of these cases that comes stock with a side panel fan that blows directly on the graphics card. The GPU net temps reflect that. 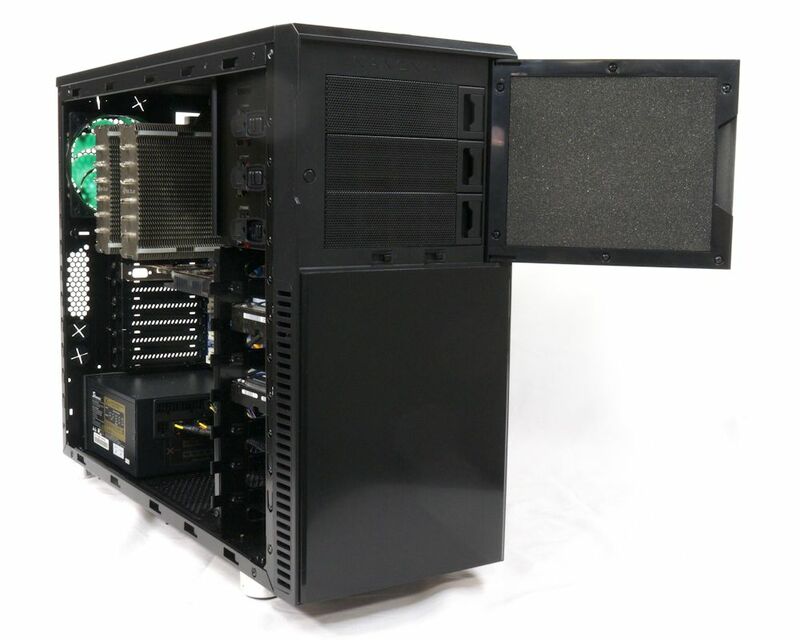 Also note that this big $249 case comes with 200 mm fans, which are inherently quieter than smaller fans. The next chart shows the net temp readings for the SSD and the hard drive. 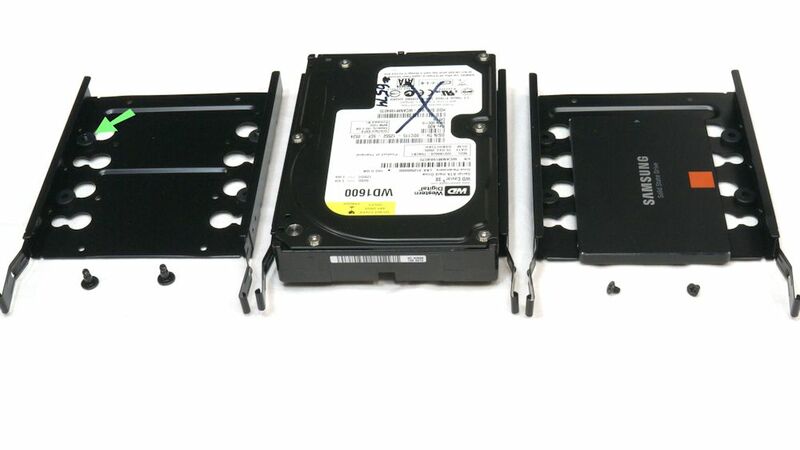 The standard position of these drives is the SSD in the top tray, the HD in the next. Since the top tray typically got less airflow than lower the slots, the SSD temps were relatively high. Of course, that was still a low temperature. With an ambient of 18.6 °C, a 3.4 °C net temp means the drive is only at 22° C. In this case the Nanoxia Deep Silence 2 did OK.
We are all aware of cases that are quiet because they have large fans that spin slowly. But that leaves them vulnerable to loud heatsinks. The Deep Silence Concept is to muffle the case contents. So, we will look at how well the Deep Silence 2 muffles its contents when fans are added to the heatsink. 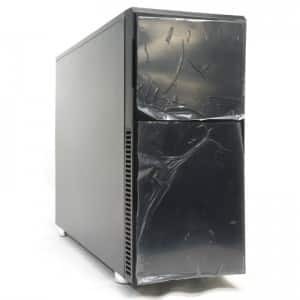 Because the DS-2 is designed to produce deep silence, you will want to use a quiet heatsink if you buy this case. The Noctua NH-D14 with its stock fans will do nicely. Note that I have changed the positions of the SSD and the HD. 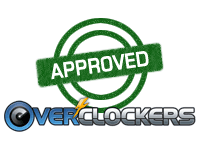 To interest the people who come to Overclockers, I cranked up the CPU to 4 GHz @ 1.326 Volts. First I measured the noise and temperatures with the case open, fans set to High. The SPL meter was set 10 cm from where the panel would be. In the chart below, the dBA readings are unadjusted. The motherboard cavity will not attenuate noise with distance the way a point source will. Next, I closed the panel and measured the noises and temps again, first with case fans set to High, then with case fans set to Low. The SPL meter was set 10 cm, again with unadjusted readings. A flat surface also does not attenuate noise. You can see that replacing the panel will reduce the measured noise by about 10 dB. That’s a big reduction, but you can still hear fans. It is not worth dropping the speed of the case fans because the heatsink fans put a floor under the noise the case makes – you can’t get quieter than 39 dB. Hmm. The most annoying thing about this case is the quiet click of those front fans – at least if you sit within half a meter of your case, as I do. Hmm. That suggests a plan. I removed the fans from the front filter, and put the filter back. 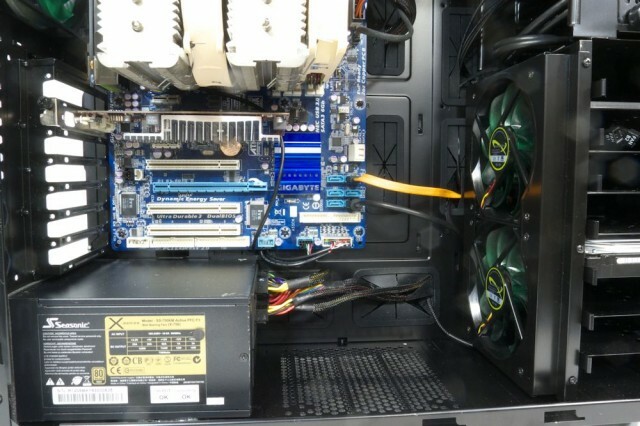 Then I put the fans in that mid-case fan mount. Now, rather than push fans, they are pull fans. This sets them behind the HD cage while still pulling air through the front filter and across the hard drives to cool them. The last thing I did was to remove the rear slot covers. 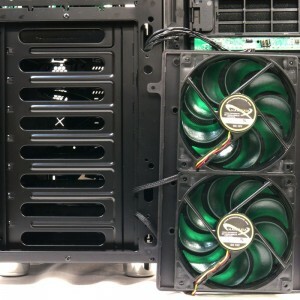 With the (now) mid-case fans pushing air into the space between the PSU and the graphics card, if we provide the air a way out, maybe it will cool the graphics card as it escapes. So far it looks like a good plan, and the fans came with the case so there is no additional cost. Of course, you already know the results. Compared with the closed case, the graphics card is 4 °C cooler, the CPU is a degree and a half less hot, and the noise is the same. I’d say we have a winner: this is the way you should set up your fans in the Deep Silence 2. As for the hard drive, its net temp was about the same. But the SSD showed a marked rise in net temperature. This is probably because it simply did not get enough airflow. Putting the drive in a lower tray would have kept it from warming up. Not that it got very warm: at 6 °C over ambient, the SSD was under 25 °C. The most important news is the noise. At the corner the SPL meter measured 42.5 dBA, which attenuates to 22.5 dB at 1 meter. In essence, the sound pressure level was nearly the same as an empty case. With this difference, I could hear no clicking. That’s right. Moving the fans from the front to the mid-case mount got rid of the clicking. Sound-wise, this is clearly a superior arrangement. It gives you even deeper silence. Of course, if the front filter was made like the bottom filter you would get better airflow. That would be a quick and easy fix for Nanoxia to make. If you like working with tools, you will like working with this case. Despite the occasional struggle with the EPS extension cable, the Deep Silence 2 is fairly well thought out, and not difficult to work in. Everywhere you look you can see that care has been taken to make this case versatile. You can also see that care was taken to keep this case affordable. Since Newegg is selling the Deep Silence 2 for at $89.99, it seems that Nanoxia has managed to achieve the affordability goal. For that price, this is a great case. Versatile – can be used for water-cooling, and can be used with a variety of fan arrangements. It is versatile enough that coming up with cooler variations (pun intended) is easy. Easy to keep the filters clean. Can be made quieter by turning down the fans. The fans quietly click – all three of them. 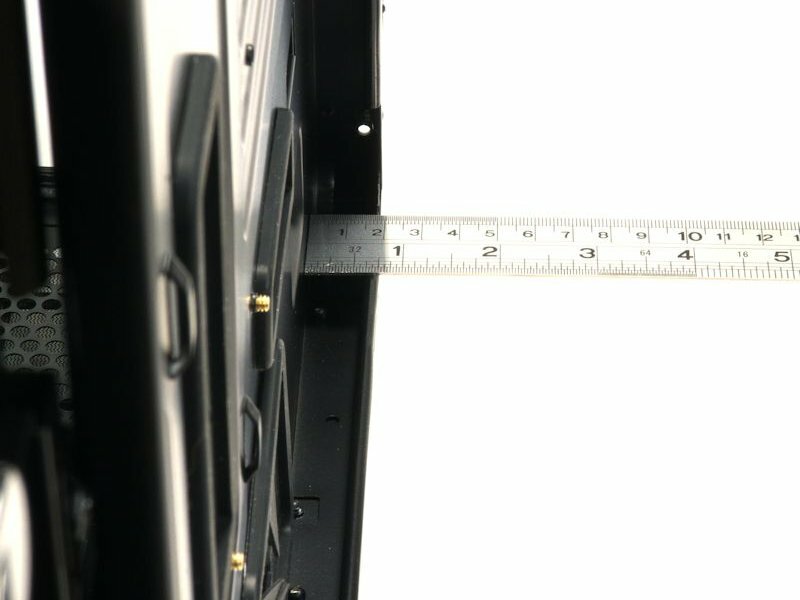 Except for the 5.25″ slots, not a tool-free case. There is not really enough space behind the motherboard and the hard drives for cable management. The EPS expansion cable is hard to push through the back of the case. The front filter is unduly restrictive. It would be better if it were like the bottom filter.